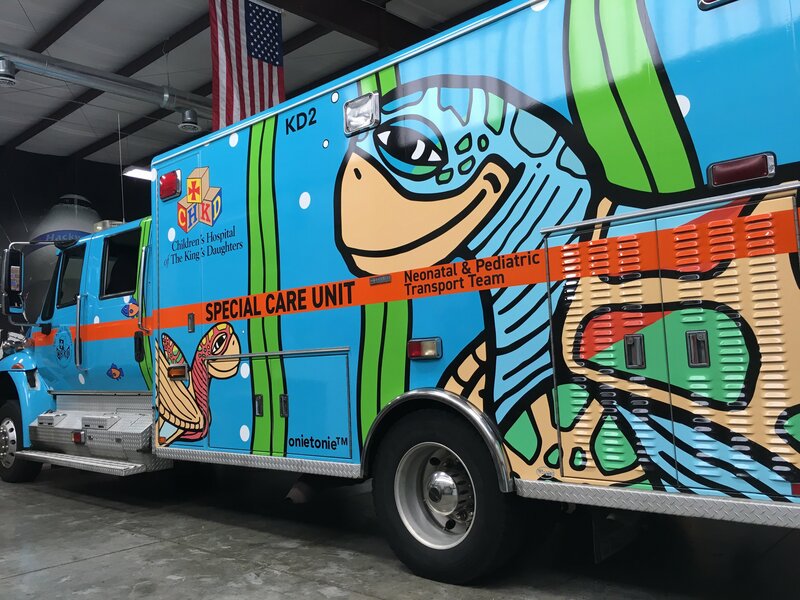 Three ambulances at Children’s Hospital of the King’s Daughters (CHKD) have new child-friendly vehicle wraps courtesy of Davis Ad Agency, OnieTonie™ and The Graphics Shop (TGS). The project features original artwork by Virginia Beach artist Troy Summerell who is known professionally as OnieTonie™. 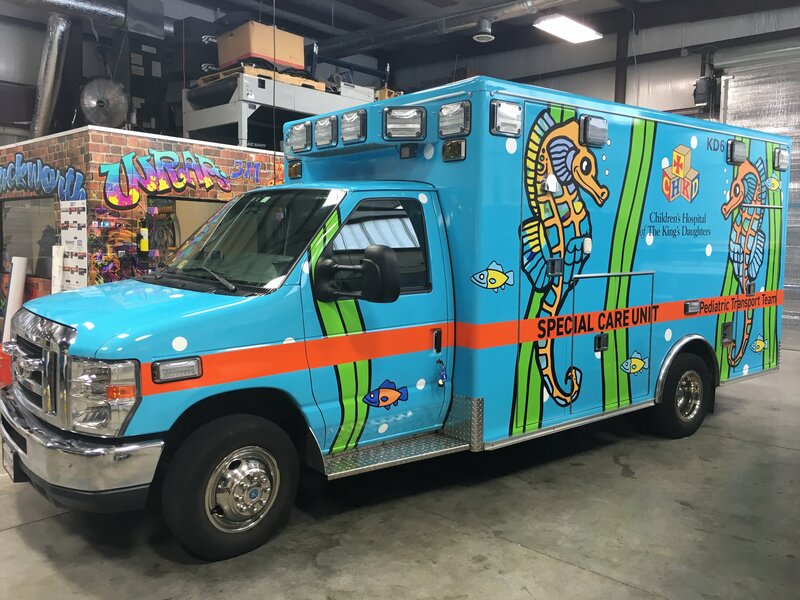 Each vehicle has a unique design – seahorses on the special care unit and fish and sea turtles on the two larger special transport units. The vehicle wrap project has been a collaborative effort from its inception. CHKD brought on Davis Ad Agency to spearhead the project. Davis Ad Agency reached out to OnieTonie™ to paint the artwork that was used for the wraps. TGS, a Hackworth Company, was contracted to print and install the graphics. The King’s Daughters, Farm Fresh and We Promise Foundation contributed funds to make the project possible. The Graphics Shop is a Hampton Roads based veteran-owned small business specializing in vehicle wraps, signage and industrial UV screen printing. As a 3M Certified Graphics Installation Company, TGS not only serves local customers in Virginia but also works alongside companies and agencies throughout the United States to provide high quality printing and installation of graphics. As a pediatric and neonatal hospital CHKD seeks to provide a comforting atmosphere for children. While a trip to the hospital via an ambulance can be unsettling for anyone, they can be especially so for a young child. 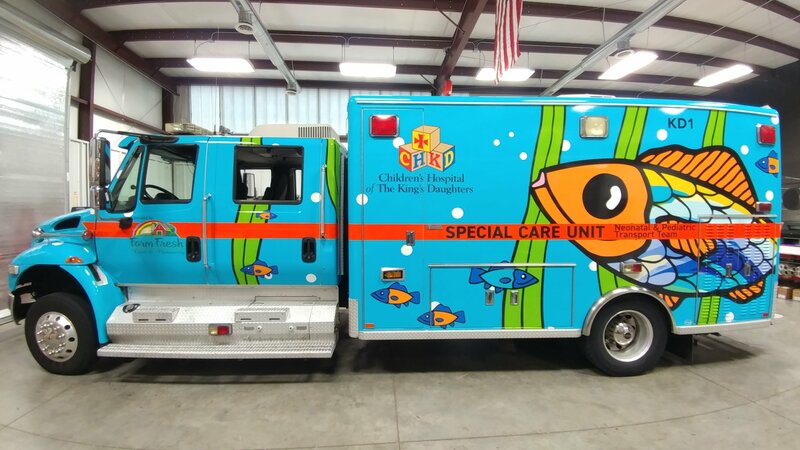 With the welcoming and vibrant artwork, CHKD is able to improve the ambulance ride experience for all children. OnieTonie™’s colorful and positive art can be found throughout Hampton Roads. He has large scale public art (murals) in the NEON, Norfolk’s Art District and several large pieces at the Oceanfront; Java Surf™ Cafe & Espresso Bar, Star of the Sea Catholic Church & School, as well as painted basketball backboards at WT Cooke Elementary. OnieTonie™ had a previous relationship with CHKD when he was commissioned to paint a large scale mural in CHKD’s new Landstown Health Center in Virginia Beach. This state of the art building has an illuminated, colorful school of OnieTonie™’s signature smiling fish that runs across the 2nd floor of the building. This mural provides a positive beacon greeting the patients and their families at night. An important note is the OnieTonie™ fish that featured in the health center mural also matches the smiling fish on the KD 1, one of the newly wrapped CHKD Transports. Those look absolutely wonderful. Great job for a great cause. Thanks, Sonja … we’re glad to have been a part of it! Wow! What a special project! I love OnieTonie’s designs and the wraps look amazing! A spectacular job by all! Those Ambulances look good and i have been a Chkd Transport Team fan for years you just got to love the work they do for the kids great work on the vehicles guys.